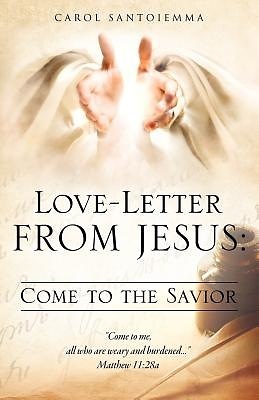 Love-Letter from Jesus: Come to the Savior is an inspirational, transformational book, permeating with the love of God, and His desire for a deep, intimate, personal relationship with you. While on a missionary trip, under the inspiration of the Holy Spirit, Carol Santoiemma received a Word from the Lord: Love-"Letter from Jesus," which she used as a template for this book. Quotes of "Love-Letter" are interspersed throughout the book; along with many corresponding Scripture verses, and brief author commentaries. It flows with a consistent beckoning to "Come to the Savior;" consequently, it will draw you directly to the Throne Room of God's love, and the fountain of His Grace, His undeserved favor. This book can serve to help Christians re-establish their relationship with Jesus; or, it can help non-Christians learn the basics of God's love, and His plan of Salvation. It is also an excellent tool for missionaries, study groups, Evangelists, or anyone wishing to partake in the Great Commission. Dear reader, Carol prayed for you, and every reader personally, that God will touch your heart, through "Love-Letter." "Come to the Savior," and see what answer to prayer awaits for you Carol Santoiemma is a born again Christian, Sunday school teacher, and missionary. She's served the Lord in Evangelistic, medical, prison, and other ministries. She is also a licensed nurse, specializing in Hospice nursing. She enjoys freelance writing and sharing Evangelistic material as her new mission field. She has written Love-Letter from Jesus to You: Come to the Savior to encourage her readers to accept Jesus as their Personal Lord and Savior, and to have an intimate relationship with Him.